I don’t mean to alarm you, but it’s true. I know that, as I write this, the A’s are clobbering the Padres. And earlier on Wednesday, the Blue Jays took a one-run game over the Braves. But also, the Reds beat the Tigers. There is plenty of season left to go, and it’s a guarantee that there will be events that surprise all of us, yet for right now, at this moment in time, in interleague play, the National League has a better record than the American League. You can understand why this is notable. I write a post like this once or twice every season. I mean, not a post like this, but a post that serves as a midseason interleague update. The posts have generally all said the same thing: The AL still looks like it’s the better league. That statement has been true for quite some time. Because there’s still so much baseball left, the AL could end up better in 2018 once again, but I thought I’d give you a snapshot of our present reality. I think we’ve all been waiting for this! If you’re not familiar with the background here, this first plot should tell you what you need to know. 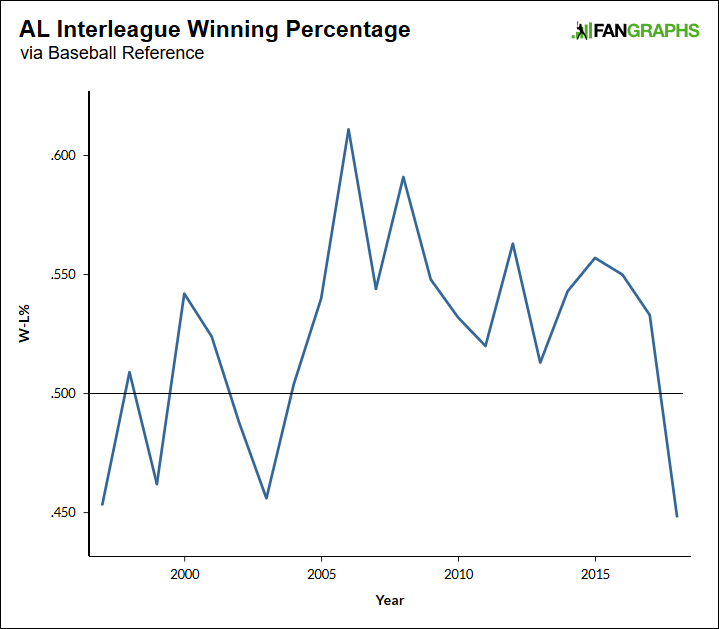 Here is the AL’s year-to-year interleague winning percentage, stretching back to 1997. As of right now, there are 116 interleague games in the books, meaning there are 184 remaining. Our sample is small, but not so small as to be completely and utterly useless. The leagues kind of alternated there at the start, but the AL took over in 2004. That’s precisely what makes this remarkable. Under ordinary circumstances, we might not care very much which league fares better in a given season. But the AL has taken interleague play for 14 years in a row. That’s a streak that’s almost old enough to start learning to drive. Some years have been more lopsided than others. In 2004, the AL won just two more games. In 2006, it won 56 more. The margins have risen and fallen, but they haven’t fallen into the negatives. Not until now. I always like to look at other measures, besides just wins and losses. Might the record be misleading in some way? This should be treated as if we’re looking at an individual team. 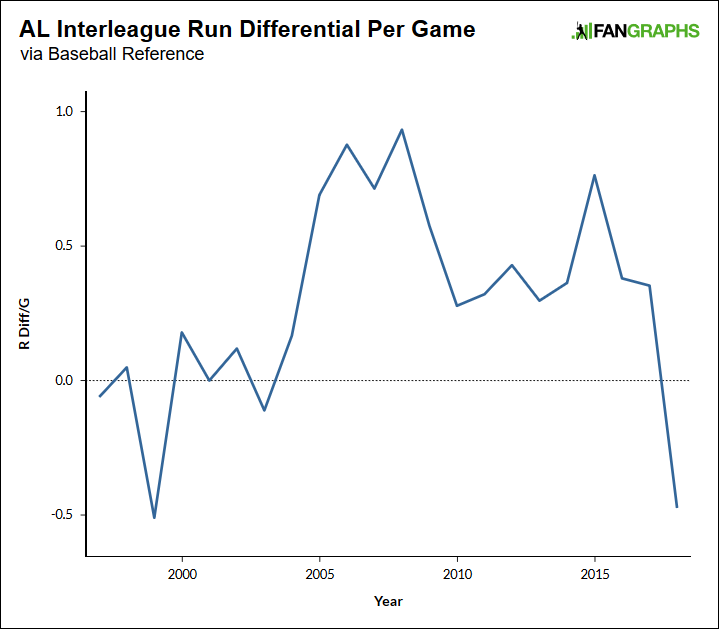 So for this plot, let’s check out the AL’s interleague run differential on a per-game basis. Think of this as looking at interleague play through a Pythagorean lens. Nope, nothing misleading — the NL so far has outscored the AL by nearly half a run a game. The AL, again, has had the run-differential advantage since 2004. It had a massive advantage in 2015. Back in 2008, the AL outscored the NL by an average of almost an entire run. The NL is in the process of turning the tables. And now it’s time for just one final measure. Several weeks ago, I got a random text message from some baseball person pointing out that the NL was off to an early interleague lead. Indeed, it was, but I noticed at the time that, despite that, AL hitters had generated the superior interleague OPS. This plot is similar to the one above, but showing OPS differential instead of run differential. OPS is a good indicator of expected runs. So, before, we looked at a proxy for Pythagorean record. This is a proxy for BaseRuns record. It all lines up. In interleague play, the NL has won more games. It’s also scored more runs, and generated the better OPS. The current OPS differential is 13 points, and the AL has finished with the OPS lead for 15 years running. You can see things got close in 2013, but, close isn’t enough. The NL finally has an actual advantage. For the sake of being more accurate, I could’ve calculated interleague wOBA instead of OPS, but I got all my information from Baseball Reference, and they don’t have wOBA displayed. 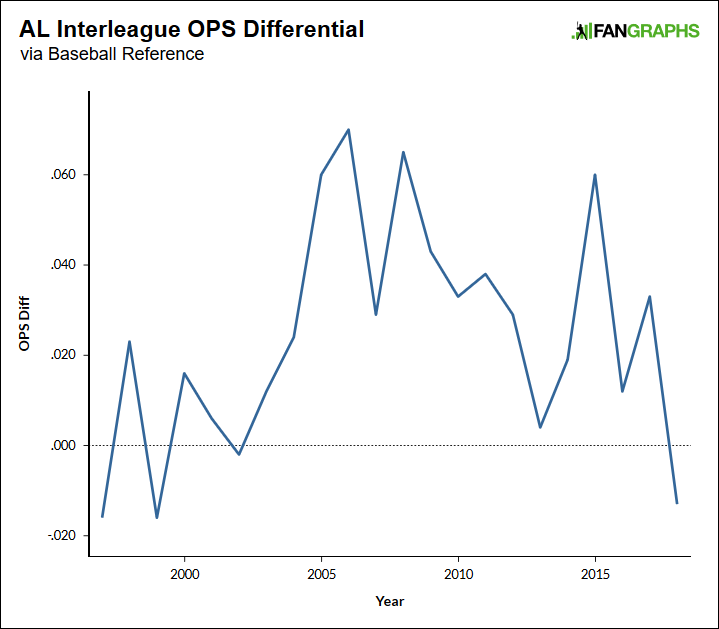 It shouldn’t make a significant difference; wOBA and OPS are tightly correlated, and switching to wOBA wouldn’t reverse the NL’s present lead. Maybe calculating wOBA is something I’ll have to do later on, should the gap narrow, and when even more games are in the books. There is just one asterisk. To this point, through 39% of the interleague schedule, the NL has outplayed the AL. And by the end, everyone will have played an equal number of interleague games, barring the rare cancellation. So, by the end, the league numbers can be taken as being representative. But the AL teams who have played the most interleague games are the Twins, White Sox, Orioles, and Blue Jays. The NL teams who have played the most interleague games are the Nationals, Brewers, Pirates, and Cardinals. The weighted average winning percentage of the AL interleague participants so far is .477. The weighted average winning percentage of the NL interleague participants so far is .513. That is presumably responsible for some of the NL’s performance. Maybe all of it. Moving forward, better AL teams will play more often against inferior NL teams, and the numbers will likely reflect that. We’ll see, then, if the AL manages to climb back to a better-than-.500 winning percentage. There should be 184 more interleague games. If the AL wants to get to a final record of 151-149, it’ll need to go 99-85, good for a winning percentage of .538. Last year the AL finished with a winning percentage of .533; the year before that, it was .550. This is absolutely doable. It’ll just require teams to beat the teams they should be beating. So concludes this June 20 interleague update. I never really know if anyone truly cares about this, since nobody roots for leagues, but even if you’re not interested in interleague play itself, you might be interested in a jeopardized streak. The AL has taken this for so many years. The AL has been the better league for so many years. If it wants to keep that up, well, there’s work to do. We hoped you liked reading The National League Is Winning by Jeff Sullivan! This surprises me, because AL players have been dominating the FG leaderboard, all but two of the top thirteen currently. It’s possible, of course, that the AL has more elite talent, but the NL makes up for this with better players in the second tier. It could also mean (if indeed the AL is worse overall than the NL) that if you put the top NL players in the AL that their stats would be better. Stupid question, but I’ve always wondered this… Are AL players penalized by context-neutral stats such as wRC+ or OPS+? Having a DH instead of a pitcher batting raises the leaguewide offensive output, so it kinda waters down context-neutral stats. Would that mean Mike Trout would put up even better numbers in the NL? Am I reaching hard to find another reason to glorify Trout? Probably. wRC+ is calculated against a baseline of non-pitchers’ performance. The NL’s overall wRC+ is 94, the AL’s overall wRC+ is 99 (because their pitchers do hit a bit in interleague games), but if you filter to non-pitchers each league’s overall wRC+ is 100. So pitcher hitting itself wouldn’t water down context-neutral stats–a player still has to hit as well as the average non-pitcher to get a wRC+ of 100. The one thing is that the DH does boost league stats a bit because DHs are above-average hitters (wRC+ of 108).